I'm taking a break from blogging today to relax and celebrate my upcoming birthday. 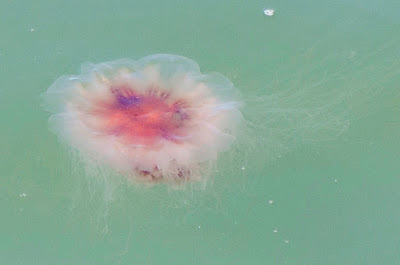 My relaxation plan so far is to drift from meal to meal like a jellyfish. I saw the one pictured here from the Brooklyn Shore of the East River. I think it is what they call a Lion's Mane jellyfish but I am too languid to find out more right now. Click on the picture to enlarge. I'll be back next Sunday. I'm an August "girl'" too, Julie. Perhaps that's ONE of the reasons I appreciate your content! Did you know that August is the month with highest birth rate in the United States? When was/is the date of your b'day? Happy August birthday to you! 12th here!